$95.00 Classified NKVD map of the Eastern Black Sea including the city of Batumi; dated 1931, the region looked much the same during 1942-1943 when the Red Army was locked in heavy fighting with the Wehrmacht. 30 1/8" x 26". $150.00 Map covering a broad area of Eastern Europe including Danzig, Kiev, Minsk, Warsaw, Gomel, and Chernigev, dated 1936. Notations on the obverse in red pencil, section of notes in pencil all appear to be air force related. 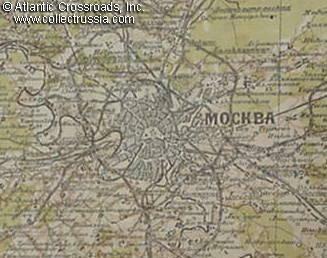 $120.00 Map showing large area of Ukraine including Smolensk, Zhitomir, Kiev, etc. Printed in 1953, based on an earlier map composed in 1947. A historically interesting document of a very important area, the location of heavy fighting not just in WW2 but for centuries beforehand. $90.00 Large combination map of Southern Mediterranean, Red Army General HQ, 1945. $42.00 Map of Turkey, Red Army General HQ, December 1945.